Take one look at the Ping iWedge, and it's not hard to see the inspiration for this club came from the original Ping Eye2 design --a wedge that was much beloved among Tour pros for its versatility, playability, and performance. This updated version features a deep multi-level cavity that helps to maximize the perimeter weight design, increasing the moment of inertia (resistant to twisting) as well as the overall forgiveness of the club. This cavity also places the Center of Gravity (CG) toward the face, but also low in the head to give the club a solid feel at impact. Unlike (to my eye, at least) the Ping Eye2, the iWedge has a more classic shape to the head. The Eye2 had a high toe and, with that flat steel finish, looked more like a yard implement than a golf club. The iWedge goes back to more traditional roots -- a design that should do nothing but inspire confidence as you prepare to hit your shot -- be it from behind a tree, from the fairway or blasting from a greenside bunker. Another Ping innovation is the "Sand Cup" sole design -- this design moves the pivot point further from the leading edge and is designed to help get under the ball quickly (and not dig into the turf) for higher, softer landing shots. Ping has kept their usual non-glare finish for the club head and added only black paint fill for the model and club head number. 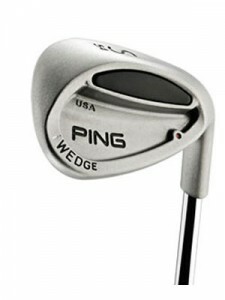 The Ping iWedge is available in Right hand only and in loft increments (2 degrees each) from 50 to 60 degrees. For those looking (needing?) to truly customize their wedge, Ping has introduced a patented design called Flat Top Hosel, along with the Hosel Notch. The flat top hosel is designed to reduce stress and improve feel in the club. The hosel notch controls the bend point for precise loft and lie adjustment. Just be sure to see your local pro or golf repair shop to make any bend adjustments to your club.